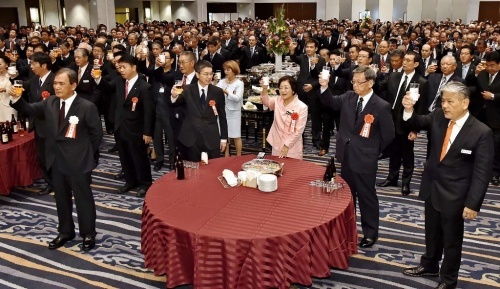 Attendees of the New Year’s banquet for economic organizations toast to their hope that Okinawa’s economy develop further on January 4 at ANA Crowne Plaza Okinawa Harborview in Naha. Thirty-one economic organizations including Okinawa Prefectural Federation of Chamber of Commerce and Industry met for a New Year’s banquet on the evening of January 4 at the hotel ANA Crowne Plaza Okinawa Harborview in Naha. In order to strengthen the trend of expansion in Okinawa’s economy, various industries represented at the banquet resolved to come together to realize a new stage in Okinawa’s economic development, with an eye on growing Asian markets. About 650 people attended the banquet. Yukikazu Kokuba, head of both the Okinawa Prefectural Federation of Chamber of Commerce and Industry and of the Council of Okinawa Prefectural Economic Organizations, delivered a greeting at the banquet as a representative hosting the event. In his greeting he mentioned that tourism, as the leading industry of Okinawa, will continue to grow. Investments from both Okinawa and other parts of Japan for construction of hotels and the like, he said, provide an important boost to strengthening the tourism industry. In addition he stated that making Okinawa a forerunner requires flexible responsiveness. Governor Takeshi Onaga delivered an address as a guest speaker, expressing his sense that Okinawa has the potential to act as a hub within Asia for telecommunications and for international logistics. If the outlying islands are developed and made inviting to tourists, he said, tourism to Okinawa will increase. He hopes that Okinawa’s economy will further develop and gain distinction in the economic world.